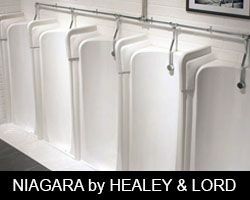 The Healey & Lord range of Niagara vintage urinal stalls, can be configured as either floor standing urinals or floor-recessed urinals. Available as single or multiple urinal stalls, the Niagara urinal range is a unique stand-out design for traditional slab urinal. These retro style urinals can be provided with matching ceramic splash guards and floor plates. The urinal stalls can be installed individually with a space between them or in a fused row. Please contact us for more assistance and advice regarding the various configurations. Niagara urinal stalls can be purchased individually, or as part of a pre-configured pack that contains a urinal stall, flushing system, sparge pipe, inlet and waste. We offer Niagara packs with infrared sensor controls, available with either direct flushing or more traditional indirect piped systems with cisterns for concealed or exposed pipe work. Please note, as Niagara urinal stalls are large items, a shipping fee will be applied at the checkout based on the number of stalls purchased.